How often we do not notice the simple things, that surround us. We throw away plastic bottles, hand over for recycling old tires, send to the scrap old packages. At the same time we dream to equip the comfort in your home, in the country or in the workplace. We are looking for money and buy in three road favors, when you could have saved, fashioned Decoration improvised. 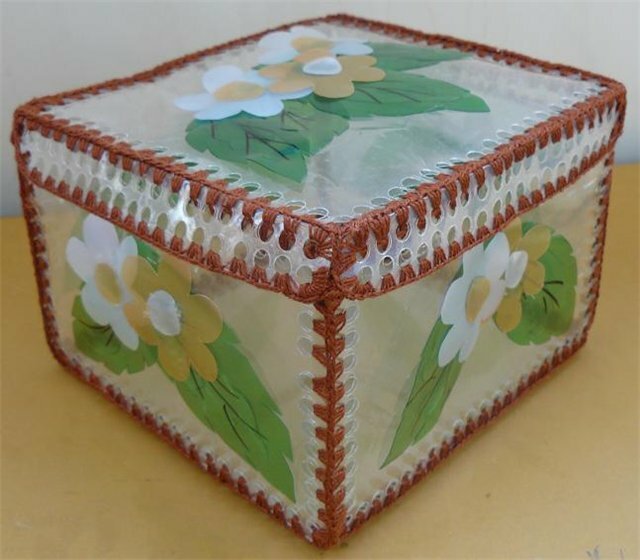 for example, you can easily decorate your interiors crafts from old plastic bottles. To do this, you need to stock spare time, clean empty bottles of plastic and trust your imagination. 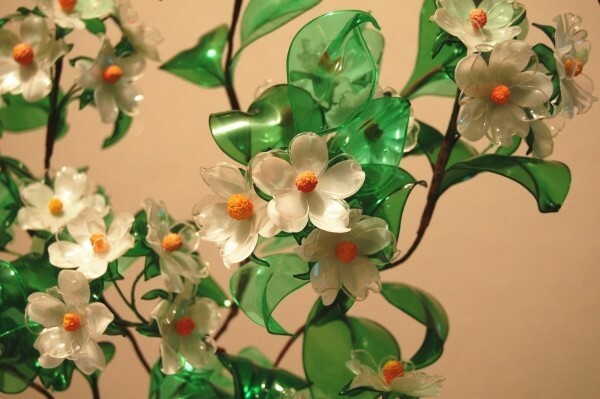 Articles made of plastic bottles for the garden, garden and children's crafts It is great to decorate our interior. How often parents notice, that their child coldly refers to purchased expensive toys and willingly plays with the simple things, used in everyday life. The kids are very fond of the sound, which produces plastic bottle with a coin on the bottom. Moreover, that they prefer home-made smart rattle, which not only makes noise, but smiling all his clown's mouth. Plastic is one of the most popular materials in the world. Because it makes the dishes, storage facilities. Plastic is used in printing and manufacturing toys. Plastic windows and even create furniture. 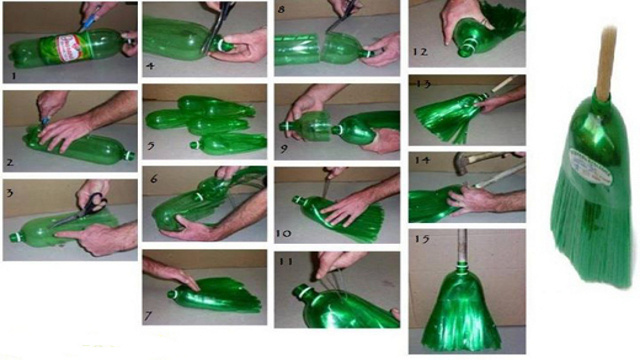 Empty plastic bottle – an excellent material for creativity. The thin walls of the bottle are easily cut. Stoppers complement horizons for imagination. Plastic bottle is very buoyant, design, which are derived from its stability and durability. Let us turn from theory to practice. 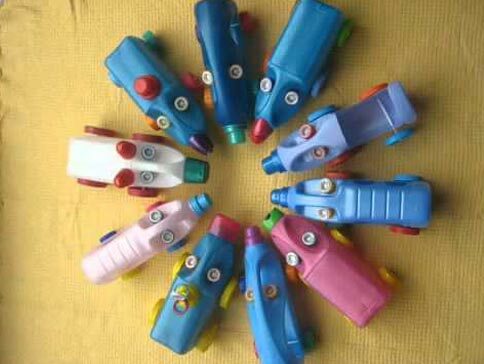 To create a rattle and a coin box from a plastic bottle, we need 6 upper portions of identical plastic bottles (eg 1,5-2 liter capacity). On the first bottle perform markup. From the neck puts 3,5 cm and put a mark marker. Such marks need to do 3-5 pcs, slowly turning the bottle around its axis. Then we arm office knife, or scissors for cutting wallpaper. Carefully poke through the plastic and cut the neck of the bottle so, to cut the line was flat. Such precision in the work we have to observe in order to further manipulation. When all carved necks will stick together and twist screws, I should get the ball. To decorate diy fasten all caps, leaving a few coins in the container. Beautiful rattle piggy-ready. If you are cooking a rattle for baby, then the twisting of covers neck should be coated with adhesive. This will avoid that, that a young child will disassemble the product and get to small parts, (in our case, coins). If your child loves Africa, hot climate and palm trees, and the window winter and snow, do not despair. The child can and should please, It's so easy. Importantly do not dispose of used plastic bottles 1,5 liters, and carefully collect them in a separate bag. 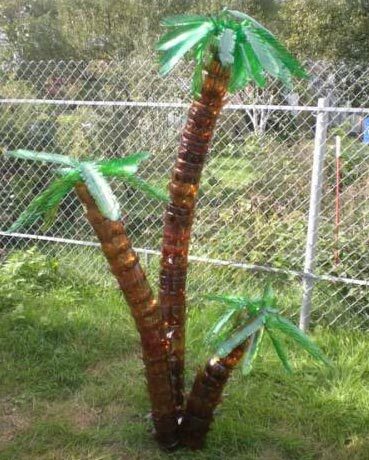 we will need for the manufacture of plastic bottles from palm trees on 20 to 30 brown plastic bottles – on the trunks and 3-4 green plastic bottles for foliage. Assembling the palm of plastic bottles is easy. Each bottle cut the bottom, stepping back from the edge 15-20 cm. Then add up the bottom of one another, promazyvaya glue them together. Height adjustable palm themselves, focusing on the number of blanks, and at the height of the ceiling in the room. Ready barrels a day should stand, glue to completely dry, and the design is firmly held. At this time, you can go to the palm leaves. In the manufacture of palm crowns you need 2-3 green bottle. Sharp stationery knife cut away the lower part and are doing it in a hole under the cover. 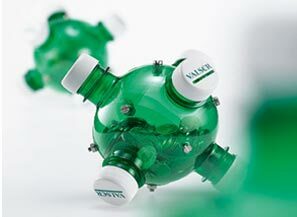 In other words – cut out a circle in the center of the bottom diameter of the bottle neck. This preform is set aside. Using a knife,, scissors or blades share the remaining base on many patches. excising, try to maintain the shape of the palm leaf. When the leaves will be ready, unscrew the cap from the bottle neck. Insert the neck to cut off the bottom of the well, to crown stood at the bottom, both on a stand. Grease the cover with glue and screw all the way. The next step attach the leaves on the stem of the palm. For this promazhte base glue the bottom and put it on top of the barrel. To complete the picture, process the leaf tips with scissors, creating a fringe palm leaf. Allow the product to dry. To palm was more stable, at the base you can place the figure of the “wild” birds or monkeys, made of plastic bottles. for example, parrot. To save money and transform the children's playground in a wonderful fairy-tale world sometimes need to trust imagination and flair. Armed with plastic bottles and critically take a glance playground. If it is a small area in the courtyard with active movement, you must first take care of the fence. To create beautiful hedges of plastic bottles can be used five-liter empty container. Each bottle reckon two factory lines of the neck and make small incisions with a knife. The width of the cut-out strip of no more 2 centimeters. The depth of the notch 3 cm. In each such bottle pour sand, rubble or other building material. Screw cap and turn down the incised edge. Bottle overturn the cover down and buried in the trench around the playground, So, so that the folded edges are well covered with earth. Bottle is recessed in the ground 1/3. When the hedge of plastic bottles ready, they can paint from a container, or cover garage paint. Such hedges can be decorated with hand-made butterflies out of plastic bottles, flowers, or plastic little insects. It is possible to arrange benches, also collected from bottles. The simplest toy from a plastic bottle can make even detsadovets. Enough to put a plastic bottle horizontally, stick at her, ears and other decorations. If you are going to do from a plastic bottle car, prepare wheels, a pair of screws knife and glue. To begin, cut the neck of the bottle, turn away the edges and glue it to the rest of the bottle so, to cover performed by a quarter. We perform in the construction of two opposite holes. This can be done using a soldering iron, or hot rod. Threaded screws and screw them on wheels. Garnish obtained product. You can cut and paste their doors, can be painted with acrylic paints car, can be stuck bumper and wings. It is easiest to do from a plastic bottle doll. overturn the bottle, glue to the bottom of the skirt, We put on the neck scarf and decorate the face of the resulting beauty. From plastic bottles can make Knight's helmet or goggles steelworker, can do for doctor suitcase, or build a whole room for a doll. As we can see, articles made of plastic bottles for the garden, garden and children's crafts classes exciting, move on to the examples of horticultural products. Usually, people, addicting and cultivation of garden flowers, plastic bottles are sent to the country for any agricultural purposes. But sometimes there is a surplus of this versatile material, and we just have to tell you, how to use plastic bottles in the country. Plastic bottle in the country can be used not only as a container for seedlings. She'll make a great sink. The easiest option is making street basin from a plastic bottle – cut off the bottom and hang it from the lid down. We pour the water on top, and we wash gently unscrewing the cap on the neck. You can create a complicated design. This will require a large amount of bottle. At the base of which bore holes. She is suspended for the cover, whereby loosening receives air and water begins to flow. The original solution, if you forget to house a removable shoes, – to make Slippers from a plastic bottle. Special tricks here is not required. It is enough to take two plastic bottles. Cut off from the top of the bottle, It is attached to the tape, and comfortable summer flip flops ready. It can be cut in the bottle and the bottom wall portion, leaving 1/3 from cover, and we get excellent homemade sneaker. If you take the bottle Larger, you can make them good galoshes, which will save a rainy, wet weather. Decorating the garden with the help of plastic bottles a pleasure. Of course, you need to collect a sufficient number of these bottles. you need to collect, focusing on color, the shape and size of the bottles. But when all the bottles will be procured, creative site for articles made from plastic bottles will unfold at full power. Did you know, that only from plastic bottles, you can create a unique form of gazebo. For this purpose, a plurality of same color and shape of bottles stacked frame, fixed and glued. Ornaments are also a gazebo made of plastic. At the base of wood or concrete. But no heavy fabrics for awnings. The design of plastic bottles, though beautiful, but not strong. From plastic bottles can be tinkering fence. A business, of course, troublesome, but cut into pieces as needed plastic plaiting, then you can dream and create on your fence real pictures. 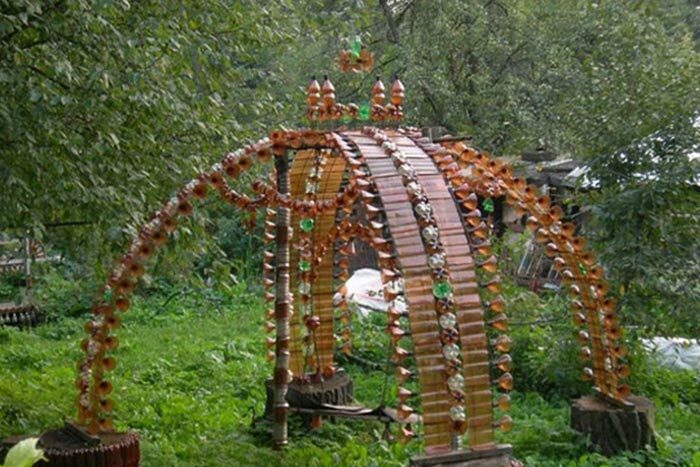 From plastic bottles carved lanterns, benches, dam for springs. Plastic products can be decorated with any cottage, there is a will and free time. One folk craftsman even overlaid with plastic bottles instead of your house front stone. One favorite crafts from plastic bottles among cost-conscious Housewives – pots for the flowers. Cut off at the neck of the bottle, we get the pots in the shape of a cylinder. To decorate it, the course is corrugated paper, clay, or acrylic paint. Cone-shaped planter turns, if the bottle cut the bottom and flip. Here housewife fantasy can work on decorating pots edges, on the decoration of his ribbons and cloth. You can create a clingy plastic, on which hangs the finished pots. 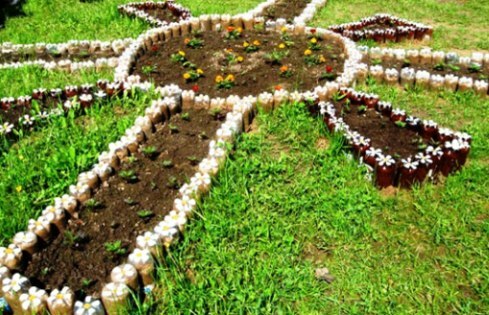 To decorate a flower bed, you can use plastic bottles with different diameters. From a single large cut flowers and flower beds adorn the walls, of the other to create a wedding flower pots, arranging the diameter of flowerbeds, and so on, which only calls fantasy. Earlier we wrote about the possibility of the creation of the facade of the house from bottles. Who would like to tell, how to make furniture out of plastic bottles in the country. for example, gathered a dozen bottles, hold them all tape, – the basis for Ottoman ready. It remains only to wrap the cloth and add to foam seat. Such blanks blocks can be assembled sofa and chair for the garden. You can make a table and a bed. Even cabinet for storing garden tools may be created from plastic bottles. Birds are frequent guests of the farmstead parcel. To the inhabitants of a small nature lived comfortably, It can be built from a bottle of a good bird feeder. To this end, the volume of the bottle 1,5 l do 4 openings. One in the neck, one at the base and two through holes beneath them. In pour a bottle feed, in the through holes to insert wooden spoon – it will be feeding bowl. Enshrines a manger on the tree. 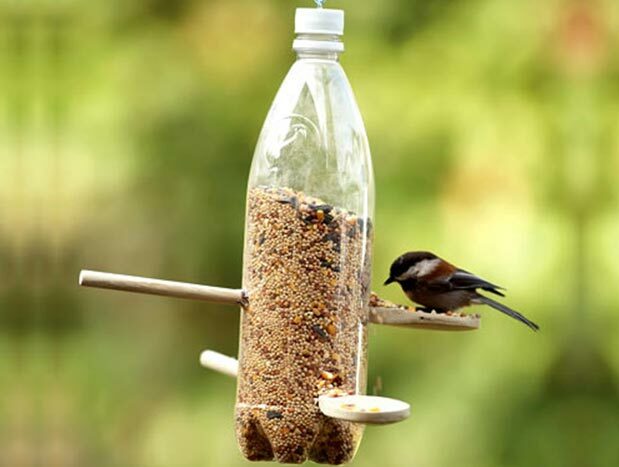 Another variant of bird feeders, made from a plastic bottle: a circular opening in the bottle. This feeder is suitable small birds, which can easily penetrate into the trough. A fun hack from a plastic bottle, which can be useful in any horticultural farm – broom. To create it will need three plastic bottles, neck and a bottom which is cut. Bottles are cut along the narrow edge and adhered to a wooden stick. The wide part of the “fluff” scissors for fibers. The more layers of plastic at each other, the better broom will sweep debris. by the way, dustpan can be constructed also from a plastic bottle. Cutting off one side of the bottom of the bottle it, securing the cover in the handle, we get a great scoop, for which it is not necessary to pay money. Every housewife dreams of purity and beauty of your kitchen. She chooses decorations, paint for walls. She buys dishes and wants to add to the interior a sort of “flavor”. Articles made of plastic bottles are not only good for the garden and garden, but also fit perfectly into the home interior. For, to update the kitchen furniture does not necessarily venturing repair. It is enough to place the right emphasis and the room will sparkle with new paint. for example, create from different plastic bottles, containers for storing junk. For such cans need two bottles of the same size plastic. At a cut off the top part, the other – the bottom. According to the cut edges of the bottom to make small bends, so that it fits snugly to the walls of plastic vessels. A finished design decorate, based on the requirements of its taste. The plastic looks great figure, applied acrylic paint. Boca jars for storage can be decorated with intricate patterns. But most of us will require imagination and cover the bottom of the jar. Today is a very popular French way of decorating the “area”. The whole secret lies in the method of twisting a square piece of paper. Finished products that are striking in their beauty and ease of handling. The only drawback of plastic jars for storage can become its instability, so the cereals and flour are best kept in a glass, a self-made tank from the bottle is better to use in the decorative direction. for example, fill them with colored beans and peas and place on the shelf, according colors. There are many options for creating a plastic bottle vases. The easiest and most affordable way to all: cut from the bottle neck, pour water and put the flowers. This method is suitable only, If you are caught by surprise, and nowhere to put flowers. But for home decoration such variant of plastic vases are not suitable. The second well-known option of creating a vase from a plastic bottle repeatedly flashed on the TV screens in the category “Crazy stick”. In this process, it is important to cut off the neck of the bottle and cut a hole in the bottom of. Insert the neck into the resulting hole and hand-tighten the lid. To be sure to fill in all the glue. Vase on base is almost ready. And the first and second vase can adequately decorate and they will complement the interior of the house so, how much work your imagination. So, in the decoration of the vase you can use a tourniquet, which is wound on a plastic surface, liberally smeared with glue. When the vase dressed in new odezhku, on the harness can be put beads, beads and other decorations, using liquid nails for fastening. Try to cut the plastic bottle along, separated from it at the neck and the bottom, spin like a glass preform for seeds and fix the base, received an unusual stand for napkins. 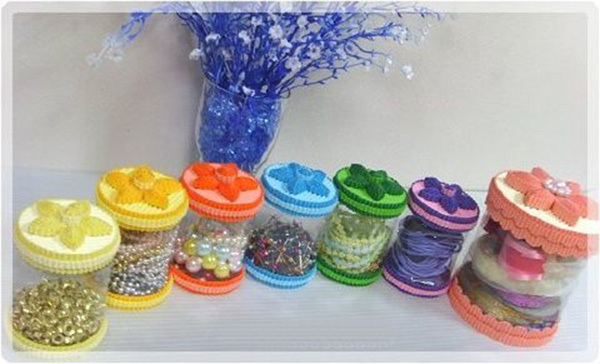 The edges of the plastic can be decorated using the hole punch or beads. Stand will be the leg of disposable cups, or cut off the bottom of a plastic bottle. If you type a lot of bottles of the same size and cut off their bottom, stepping back from the edge of no more 1,5 cm, you can collect weightless and unusual curtain. This will require a fishing line, a little patience and perseverance. Each cut bottom sealed with the other like a flower petal. You can dial the same number of bottles of different colors and to beat this feature. 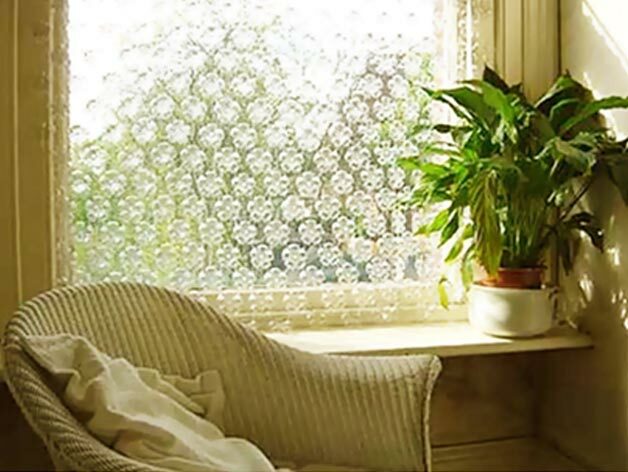 In any case, a curtain of plastic bottles on the window looks unusual and very original. 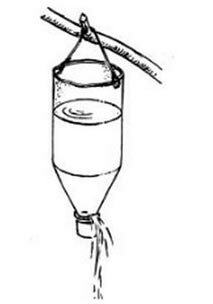 In this technique should perform any decorative pendants, made of plastic bottles, thereby creating a single interior. An interesting solution in the decoration of the house and disposing of plastic bottles would be to create a box for storage. To do this, fit a bottle with smooth walls, because of them will be cut out patches for assembly. You can cut the plastic flaps of the same size, you can experiment with the size and shape of each flap. The edges of these blanks need to tie a hook, or flash the bright thread, to give the originality of the future product. Finished grafts plastic bottles are fastened together and make up a large box, chest or cylinder for storing stuff. 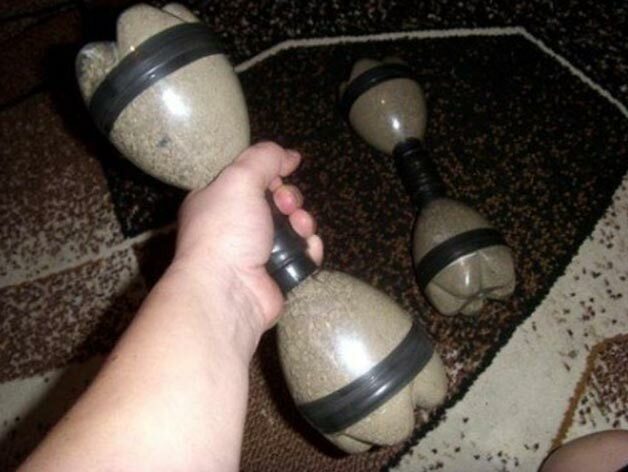 Original dumbbells can be cast from plastic bottles. To do this you need four bottles of the same size. Cut away from the bottle neck and the bottom. Middle part postpone, they we have not yet come in handy. The neck and bottom are fastened together with adhesive, of tape or adhesive tape. Fall asleep inside the sand, fine gravel or cereals and tightly screw cap. Fastening two bottle-neck and wrapped around all places of assembly dumbbell insulating tape. Now you can start training! Each of us has ever faced a problem, where to put the phone while it is charging, when there is no cabinet, table or shelf. Out of this situation is,. Enough to take a plastic bottle of appropriate size. Cut off from her part of the way, To stay form sovochkom. In the upper part of the bottle bore holes under charger plug. In the lower part of the phone is put. Add a little imagination. Coloring the resulting acrylic stand, or decorate it. using decoupage technique. You can create a decoration to match the walls and following the rules of home interior. 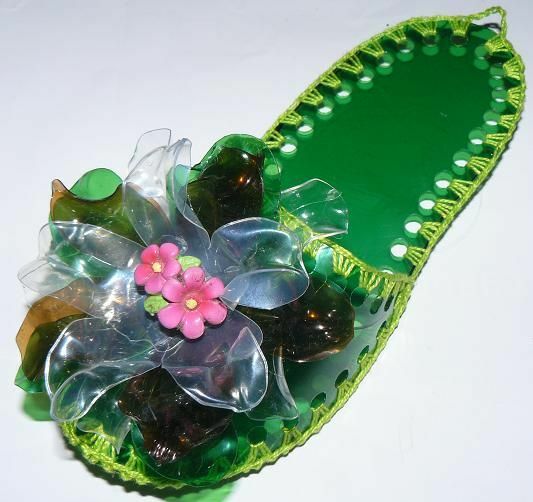 Uses of handicrafts made of plastic bottles in the garden, in the country or the children's craft with enough elements of the interior. It all depends on our desire, creativity and imagination. the main thing, creating a masterpiece of plastic, we save money and help nature.